iMessage effects are pretty dramatic, so when they’re working they’re impossible to miss when they are exchanged between iOS devices. If you’re finding that Messages effects are not working on the iPhone or iPad, there’s probably a really simple reason why, and an equally simple fix available. First things first, realize that iMessage Effects require iOS 10 or newer, that can be iOS 12, iOS 11, iOS 10, or later, and anything in between. You therefore must have a modern version of iOS on the iPhone or iPad to have iMessage Effects. For some quick background, the Messages app in iOS 10 and newer includes full-screen visual effects, ranging from a bunch of balloons, to fireworks, lasers, confetti, and a shooting star. Additionally, there are other visual effects that apply to text and images, which make the messages slam onto the screen, appear larger, smaller, or show up with an invisible ink feature. All of these visual effects are new to iOS 10 (and later of course) and work on the iPhone and iPad… or they should anyway. For the vast majority of users, the reason iMessage screen effects and bubble message effects are not working is because they have the Reduce Motion setting enabled. The Reduce Motion setting in iOS, which does away with the zipping and zooming animations that fly around the operating system when opening and closing apps, is also the only way to turn off iMessage effects. 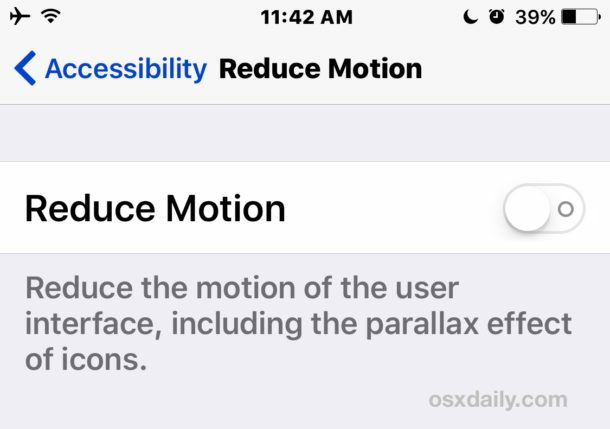 Thus, if you have Reduce Motion enabled because you get motion sickness, want to speed up iOS 10 on the device a bit, or just prefer the fading effects, you can’t have iMessage Effects. The other more obvious reason iMessage effects may not be working is if the device you’re on is not actually using iOS 10. For example, if you didn’t update to iOS 10 yet, or you downgraded afterwards, then you won’t have the feature. Now if you go to Messages and send a message with a long tap on the blue arrow button, you should be able to access the various screen effects and bubble effects. It’s a little disappointing that for now you can’t have system-wide Reduce Motion enabled while still experiencing Message effects. Hopefully a future version of iOS fixes this and gives a separate iMessage option to disable or enable the Messages effect features without impacting all other visual animations on the iPhone or iPad. Message Effects Still Not Displaying? Some mixed reports also indicate that restoring a device from a backup can work too if all else fails. Did you get Messages effects working on your iPhone or iPad with iOS 10, iOS 12, or iOS 11? Let us know in the comments below. I have a few iPhones and only one doesn’t work because the password for the apple id was not entered. We had to turn IMessages off and back on and now it works! Thank you Tori, it works! This worked for me! Thanks for being awesome! Hey, Hey, Hey, This worked for me! Thanks! The only thing that worked was toggling iMessage which happened to be the very last thing I did but I wouldn’t have tried that without reading this article so thank you! I’d just like to add that I did everything on your list and nothing worked, until I turned imessage off and on again. Reduce motion allowed me to send the effects, but I could not receive them properly. I also reset after each step, so turning imessage off and on was definitely the defining factor. Just thought I would add to the trouble shooting since it seems like you were unsure. I hope this helps. I kept messing with 3D Touch and Reduce Motion, powering off for good measure when things appeared to be working. At first I was all scientific and deliberate, not to the point of taking notes but I was paying attention and just changing one thing at the time. At first the results were inconsistent. Basically I just kept fiddling with 3D and Reduce and as of now it works with 3D on and Reduce off, as well as other combinations. The only “tips” I’ve got are to turn off messaging while you’re in Settings, and it doesn’t seem to matter whether you back out of settings from the toggle switch you are testing, that and always finish up with a power-cycle for a sanity check. Good luck, if you haven’t fixed it yet. Frankly, it took too much effort for the return. If somebody volunteers to fix it for you, let ’em, and pretend they saved the day. No, nothing is working! I tried everything you suggested. tried it all, too. It’s still not working. Works on my iPad! I have 6s with ios10. Toni, I messed with this for probably two hours and eventually fixed it. Search for my name in this thread for my experience. Thank you! Tried everything is this was the trick! Turning off 3D Touch is all that worked for me too. Turning off 3D Touch is the only thing that worked for me, as well. Thanks for the tip! Thank you, I tried all the above suggestions, but only when I turned off the 3D touch in settings did I get my iEffects back! Anne, I messed with this for probably two hours and eventually fixed it. Search for my name in this thread for my experience. Same for me. Can send but not receive. Nvmd. It just started working all of a sudden. I think it was the iMessage off and on that finally did it. My girlfriend is having the same problem. She can send and receive small effects, send full screen effects but can’t receive them. Didn’t fix it. Still just tags at the end saying “sent with balloons” or whatever. Yeah i can send them too but can’t receive. They just look like still images. Same as most of the above, I can receive but not send. GOT IT !!!!!!! I turned off my 3D text in settings > general > accessibility>3D text OFF and now it works! Yay this helped me thanks! This was exactly was helped! Thanks so much!! Worked for me too!! Nothing else did. Thank you for posting. This is the only thing that helped me too! Thanks. What’s the 3D touch for anyways? I want to know that also. That’s what worked for me. I had the same problem when I did the latest iPhone update.10.3.2 . The solution depends on the model iPhone you have. I have the model 5S and the solution is different for newer models. For the older phones you need to be careful when you push the send arrow ( it can be green or blue ) when sending a text message. To send and bypass the balloon option be careful and just quickly tap the send arrow once. If you want the balloon option hold down on the send arrow and you go into the option. If you get into the balloon by mistake just tap quickly twice the “X” and that gets you out. If you have a newer model iPhone go to accessibility and below Touch Accommodations you should see 3D touch which you turn off. This should make the send arrow insensitive to how you touch the send arrow. I thank Jessica upper level tech support at Apple for taking the time to develop this solution. Is 3D text only on 6 and 7? I don’t see it on my 5S so it may not matter. Fixed mine as well, thanks for sharing! I updated to 10.0.1 and I don’t even see 3D in my settings at all. I went to Settings, General, Accessibility, and there is nothing in there that says 3D. I rebooted my iPhone 6plus, and also reset settings, still nothing :( Anyone else have any other suggestions? Wooohooo thank you so much !!! GOT IT too !!! iPhone 7 – had to turn off 3D touch. Thank you so much. Turning reduce motion off did the trick.. Yes!!!! The 3D text is what worked!!! I tried everything and and nothing was working. Thanks Amber!! Turned 3D Touch off and on again without reset in accessibility. Nothing else worked! ??? I don’t have a 3D button in accessibility. Maybe because mine is Dutch, not English? Nothing works! iPad Air 2 works fine, 6s is a dud. Apple scruffs man, this is getting old! Disabling 3D Touch works, makes sense as the iPad was fine and the nature of the 3D Touch algorithm. 3D Touch was a dud anyway. Once 3D is off and tested, turn it back on, do a tap back first, (it should work) then try it again. It works! Restoring the iPhone 5s didn’t do it. Turning off “Reduce Motion” made it possible to send iMessage with effects, but not to receive them with effects. Turning iMessage off and back on again finally did the trick. Yes! This was what worked for me! I had to actually start a new text for it to work. Would not work while in a previous thread. Nothing worked until I shut off 3D Touch and restarted Messages. Thanks for all the ideas! Tried all suggestions – nothing worked. Do u have to have ios10 to receive effects? I don’t see a 3D Touch option either. Turning off 3D Touch worked! Thanks so much but also have to turn off reduce motion! NOTHING WORKED, literally not even the 3D thing!! U can also try to Sign out and back onto IMessages. Settings, messages, send/receive, tap on email, sign out. Turning 3D off or changing setting to light worked for me… thank you!!! THANK YOU!!! Nothing worked! Until I found your site for help. Nothing worked, I do not even have a blue arrow, I have a green one. ??????? Super-easy fix, clearly explained! Thanks…. Turning off 3D Touch fixed it for me. Reboot your iPhone, hold down Power and Home button until you see the  Apple logo. Then once you’re in Messages start typing a message then hold down on the arrow button to see the the effects and which ones to send. If your iPhone receives them you can send them too. Where is the 3D Touch? Nothing has worked for me! I can send, but not receive. I did all the steps and it works! Thanks! I’m not receiving any effects? I don’t have 3-D touch in my settings either. What should I do? I can receive but not send them. I have gone through whole list and restarted numerous times. I can’t hear the images and videos in iMessage…..
Of course not, because the moving images and GIFs don’t have audio. Only movies have audio. The iMessage screen effects have audio as well, which can get pretty annoying pretty quickly. Did you ever get this sound to work? It’s a bummer that I had to turn off 3D Touch, since iOS 10 improved it and I liked the improvements. They need to fix that! You shouldn’t have to turn off one new feature to get another one to work. I will just like to say thank you so much for this. iPhone 5s tried reseting phone and the app. Tried turning the reduce motion on and then off, but what did it was turing iMessage off and then on again. Tried everything but nothing. Got IPhone 5s. Please help!!! Just an update. It’s working but need to start a new message for it to work rather than add to existing message. It worked on the first suggestion, thank you! I have tried everything and nothing has worked, I don’t have a 3d button anywhere???? Yes!! Thank you so much. 3D motion worked. Still not working. Tried and checked everything above. Any other ideas? I am unable to send/receive iMesssages. I have tried all tricks listed above. I even went into the Apple store. We turned iMessaging off, signed out of iTunes, performed a hard reset, signed back into iTunes, turned iMessage back on and no dice. We then turned iMessaging back off, reset all settings, signed back into iTunes, and then turned iMessages back on and still not resolved. Apple sent me home with an unresolved issue :(. Is anyone else experiencing my issue? If so, Have you overcame it and how? With my iPhone 6 it works to some people on my contacts, can’t send the effects to my wife. All with ios 10 of course. Tried all of the above. Thank you! It worked after I turned off “reduce motion” and “3D Touch”. Yay! Elizabeth was right. You don’t have to turn off 3D Touch. Make sure you’re pressing down hard enough. The amount of pressure which wasn’t too much, finally got it working. Thanks Elizabeth! I tried everything twice and nothing works. Try doing a new message rather than adding to an existing message. Still does not work. Does the receiving party have to have the update also? I updated my iPhone 6 to iOS 10 this morning my iMessage games didn’t work. I sent the 8 ball pool game, on the other side its just photograph, same problem happened to other games. Did you figure out how to fix this problem? Turning iMessage off and back on definitely worked. It worked when I turned the 3D off so yay for that! Just apply more pressure to the arrow that sends the message when you’re holding it. It should pop up that way. If you want to lighten it up a bit, you can go to the settings for 3D Touch and lighten it up. Hope that helps! I was able to send messages with effects but not receive them. I Tried everything even turning off 3D Touch, and nothing was working. It wasn’t until I went into the message settings and disabled I-message for a few seconds that it finally worked for me. I got the effects to work by turning off Reduce Motion. However, the 3 buttons (Camera, Heart(?) and “A”) alongside the text box DO NOTHING!! How do I enable THEM? I had to turn Disable 3D Touch. Thanks!! I was thinking mine wasn’t working after trying all of the tricks described. But then I noticed something that is not mentioned. When you type in the Recipient’s Name or Phone Number it will change color based on whether they are a 3D Enabled Recipient or Not. If they are the Recipient’s Name or Phone Number will turn blue as well as the Send Arrow turning blue. Two other colors have shown up as well but I haven’t figured out what each color means. One is green, the other is gray (black). You are sending a text to an android phone. How the iPhone knows that, I don’t know, but I tried a few samples to see what color the arrow was. I have tried all these and nothing is working. But it is just for one person. I asked someone who texts with her and hers are going through as iMessages for them so it seems to be just between our two phones. Don’t know what else to try. The toggling on and off of the iMessage worked. Try this first! Yes they the reduce motion to “off” worked for me. It probably would have work from the jump if I didn’t keep my phone in power save mode 24/7. Turning off 3-d touch worked for me, thanks! does this new message stuff need ios10 to receive said stuff? I could send but not receive after the update. I turned the reduce motion setting on, (mine was already off) then off again, didn’t work. I then tried each tip above in order, and tested after each step with a friend. It then worked after I turned iMessages off then back on. Turn iMessage off and then back on again worked perfectly for me! Thanks for the help! None of the suggestions worked until I toggled off 3D Touch in settings. Then presto! iMessage returned to normal. What I find strange is everything has been working fine for weeks… how could a bug like this suddenly appear on its own? Oh well; it’s working again. Thanks! The Disabling 3D Touch worked! God bless you and thank you!!! Signing out of iMessage and back on worked for me. Settings> messages> send&perceive> Apple ID> sign out> Use your Apple ID for iMessage and sign back into iMessage. Found another cause… Settings> Photos & Camera> Optimize iPhone Storage -> change to “Download and Keep Originals”. Thanks. I had to turn off the 3D touch on iPhone 7. Very helpful :) Thank you!! Thank you! For some reason it worked on my iPad and not my iPhone. I don’t even know why I had Reduce Motion on?! But THANK YOU! Fixed it right away! Fixed it by going through all your suggestions! None of this, or anything I’ve tried in two other strings worked. The only thing I have not tried is restoring from backup. The crux of the issue seems to be that the blue up arrow, an integral part of the process, does not now and has never shown up on my iPhone. I have to use the send moniker in the upper left corner of the screen. I tried everything, over and over. Finally, after turning off everything – imessage, motion reduction, and 3D – and turning my phone off twice (and then turning off imessage again because it resets as “on”), it works. I guess maybe just keep trying! Tried all suggestions except rebooting the phone. The last one in your list, turning off 3D touch (iphone 7) is what fixed it for me. Once it was working I turned 3D touch back on and messaging effects continued working. Thanks. iPhone 6 – Updated yesterday to iOS 10. Turning Reduce Motion off worked for me. Issue is, I HATE having that feature off. The maximizing and minimizing of the windows and apps makes me sick (not to mention eats battery). Like someone mentioned before, I shouldn’t have to turn off one feature to have another work. I hope they fix this as I’d love to be able to bother my friends with lasers. tried everything on your list multiple times. still not working. :( i can send feature, but not receive them. I have an Iphone 5, and updated it to ios10, right after the update, I am unable to tap any of the three on the messaging. stickers, large Emoji, iMessage effects and drawing tools, literally I am unable to tap on it. I do not what’s wrong, but I am in need of help. Does this require internet connection? for it to work or need to have an imessage turned on for it to work? My co-work has an iphone 5s but his is working fine. Turning off 3D Touch is what worked for me. I’m not sure how important that is to have turned on, but I’m glad I’ve got this issue figure out. Thanks so much! Had to disable 3D Touch. Thank you for this publication. Very helpful. Yes Claire, iMessage effects requires that iMessage is enabled. Kind of like how you can’t use an iPhone if you don’t have an iPhone. Do everything. And then send the game from a phone that is working but include a message. That finally worked for me. Try everything every combination. Add a message with every combination and it will eventually work. Tuning off your phone in the combination. It’s good, accurate, and has fixed every Message effect problem I’ve had! Get iOS 10 and read it! I can get to the bubbles page and select a type of bubble but then I never can get back to the message to actually send one. Can’t get out of the choose a bubble screen. THANK YOU!!!!! I was so sad when it disappeared because that was my favorite feature in iMessage!!!! You guys ROCK!!!! Disabling 3D Touch worked! Thanks! Thank you-turning off reduced motion worked…but, some text recipients show a green arrow not blue? Can you please advise what to do? Yes, Blue is iMessage, green is text message (SMS). Turning off 3D touch was the only thing that worked for me but I didn’t want to loose the 3D touch feature as I quite like it. I turned 3D touch back on and changed the 3D touch sensitivity to “light” and it works great! Now I can keep 3D touch on and access the new imessage features! YAY! Thanks. It worked after forced reboot and turning iMessages off and on. Turning off 3D Touch is what worked for me! Had no idea about all these other features that are more “hidden” until recently and just now I’m getting to use them. Turning off 3D Touch is what did it for me. Thanks! Turned off 3-D touch n it works. Thank you!! Turning off 3D Touch did the trick for me! Thank you! Mine is finally working again. I had to go to settings & turn off the 3D Touch feature. I tried all of that but nothing works on my i5s !! Any ideas ? Iphone 7 and the only thing that worked was turning of 3D touch. Have been searching for an answer for days and it was here all along! Nope, nothing has worked on my iPhone 6+. The effects worked at first, then just disappeared! I’ll have to wait for a bug fix from Apple it appears. Hi i tried everything but nothing works!It just says message not delivered and i have tried everything and it still doesnt work! Someone help please. I’m trying to turn these effects off, they are the dumbest thing I’ve ever seen and Steve is rolling over in his grave. Shame on Apple for this nonsense. No luck! Previously, I was enjoying the enhanced text features but for some reason they disappeared. Not only can I not find the reason but I still can’t find the solution. Notably the “blue arrow” is currently gray. Turning off 3D touch worked for me. It worked!!! Turning iMessage off and on was definitely required. Thanks!!! Turning off 3D Touch was the one that worked for me :) thanks!! Had restored a month old update from and iPhone 6s to my new iPhone 7, and the effects failing to show up were the only issue that has now been fixed! The only thing that worked for me after trying everything else was to follow the instructions above in the reply from “Vix” to change the send arrow back to blue. Mine was green. I think the problems were after the latest update. Things seem to be working now. I tried everything! Last one I tried was 3D Touch and that made it work. Thanks! It doesn’t work. I’ve tried everything and it just doesn’t work. Great tips, this fix worked for me – thanks for sharing! Yes! Thank you. It was the 3D Touch – needed to be disabled. So, this means Effects and 3D Touch can’t both be working? Disabling 3D Touch was what worked for me. Reduce motion was already off. Thanks! So I had to turn off my 3D Touch… does that mean I have to leave it off to use iMessage effects? I wanted the screen effects like all my friends had after the iOS 10.2 update but it wouldn’t work. So finally one more reworded search and I landed on your site! Turning off 3D Touch worked. Not sure as to why. No idea why we are being advised to log off imessage or disable the motion option. It’s the 3D Touch that is at fault . I disabled mine and suddenly I can use invisible ink !!!! You need to change your advice or add the 3D Touch as a reason as well . Only worked when I disabled 3D touch. None of the other steps worked. Nothing worked. Disappointed. Want my iPhone 6 Plus back. Delete the group text and started a new a new one, if you don’t mind losing the conversation. The send arrow was not blue indicating an imessage (at least for me) but now it works! Nothing would work for me and finally I tried the 3D Touch thing and it worked! I was just about to do the factory reset and I’m so happy I found this thread. Thank you! Deleting the message thread finally solved the problem for me! Thank you!! Turning off 3D Touch was what worked for me. I went to turn off 3D Touch, but when I used the sensitivity test I realized I wasn’t pushing the screen hard enough😜 Thanks for the tips! But in messages effects are not sending??? No. nothing is working! Ugh! Very frustrating!! I had the issue of message effects not working and turning the 3D effect off worked for me. Thanks!! I tried everything here and nothing worked. Then I switched on the MMS messaging and (Settings>Messages>MMS messaging) and now it works! Turning off 3D touch is what helped me with my Iphone6s. Thanks so much! Did all the above and still not working. I tried all of these and message effects still won’t work. It’s disappointing because the only reason I even updated my phone was for message effects. Yes! 3D Touch was enabled! Thanks so much! read to the end and finally spotted the off-hand suggestion about disabling 3D Touch. It WORKED!! Yay! 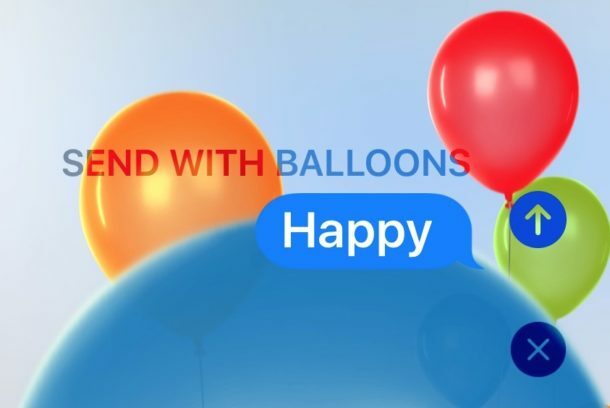 I can now send virtual birthday balloons again! Thanks much. Cannot get a new person on the bubble message. Have one person, but can’t add more. 3-D touch was the issue…. Mine worked once I got to the last step… turning 3D off. Changing the 3-D touch fixed my issue! Thank you! It worked once I turned off 3D Touch. Thank you!! Disabling 3D Touch did the trick for me. Thank you! Nothing worked until I turned off 3D Touch. That finally fixed it. Thank You! Disabling 3d touch was the only thing that worked for me as well. I got it to finally work on my iphone but it was a pain…I have iphone 6S Plus and nothing was working. I had to finally turn off Motion, turn of 3D, close out of messenger, turn messenger off and back on and also reboot. Now I can’t use reduce motion or 3D. Ugh. But it does work. When I press down on blue arrow it just makes it to where I can only see the text I’m typing and everything in the background is blurred instead of bringing up a menu. Any advice? I can see the messages, but I cannot feel the rumble sensation. Why is that? I got mine working! Had to turn 3D Touch down to the “light press” setting and I have to hold the iMessage arrow longer than normal, but it works now! No, I’m afraid this has not worked for me. yes, turning 3D touch off worked for me! thanks! Turning off 3-D touch worked. Thank you! I did everything and finally when I turned Siri back on my visual voicemail once again appeared. It’s still not working for my phone. My Reduce motion is already off and my iOS is up to date, which is iOS 11.4.1. How come it’s still not working? Thanks so much. They are finally back! Now I can go on to annoy my contacts! FINALLY!!! I tried all suggestions above and the one that finally got my effects to come back was deactivating 3D Touch. What a PITA!! Apple! None of those fixes worked for me. I have a iPhone 6 Plus with iOS 12. Don’t worry Bev, you’re not missing anything beyond a bunch of juvenile teenage goof-off stuff that makes Messages into a toy! I was beginning to lose hope as nothing was helping, but once I turned off 3D Touch it worked! Thank you so much! I was able to get it working again by turning off the 3D Touch. I recently bought this iPhone 8 & I didn’t know anything about 3D Touch & never used it so I don’t feel like I’m missing anything. Thank you so much!! Nothing else I read said anything about turning off 3D Touch and that was the problem. Now I’m happily annoying everyone with effects!! Hahahahaha, that did not work for me at all. It seems that turning on Reduce Motion and turning off Auto-Play Message Effects helps me access the iMessage effects. The irony. I had to turn off 3D Touch! Toggling the iMessage didn’t work but when I turned off 3D Touch – it did! Thank you!!! !